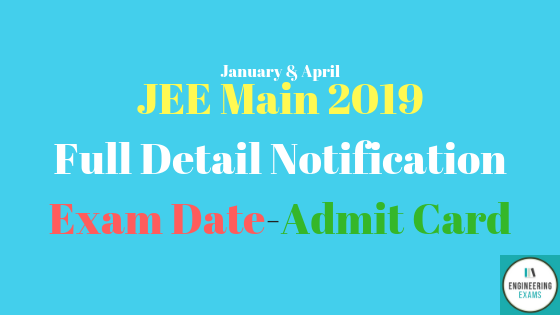 JEE Main 2019 Full Detail Notification, Exam Date, Admit Card. This article give you detail information about JEE Main Notification, Exam Dates, Application Form, Eligibility, Education Qualification, Age Limit, Exam Date, Admit Card, Important Date and Links, JEE Mains Counselling Date. The latest update news 2018 the JEE (Joint Entrance Examination) will be conducted twice in a year by NTA (National Testing Agency). JEE exams is national level exam. JEE main exam will be conducted by the Central Board of Secondary Education (CBSE). Many of students always confuse with JEE MAIN and JEE ADVANCED so my friends read my previous article Differences Between JEE Main And JEE Advanced its will help you. JEE Main will help for admission in NITs, IIITs and CFTIs. Joint Entrance Examination (JEE) Main is conducted to offer admissions to interested candidates in undergraduate engineering programmers BE or B.Tech at NITs (National Institutes of Technology), IIITs (Indian Institutes of Information Technology) and other centrally funded technical institutions (CFTIs) located across the country. Note: The JEE Main is also the eligibility test that allows students to give the JEE Advanced exam which eventually leads to admission in either the IITs or the Indian School of Mines (ISM). JEE Main exam contain with two paper which called paper-1 and paper-2. JEE Main Paper 1 was conducted for admission to BE and B.Tech while Paper 2 for admission to B.Arch/ B.Planning courses. It is important to know paper-1 is held both online and offline mode and paper-2 held only offline mode. When candidate apply for JEE main exam is must specify if they want to appear for paper-1 or paper-2 or both papers. For admission in IITs & ISM, students have to qualify both examinations, i.e. JEE Main and JEE Advanced. Below table provide you both paper-1 and paper-2 test detail. Educational Qualification: candidate who apply this exam must pass their 10+2 exam or its equivalent examination from a recognized board. Candidate who appearing this exam must pass 12th with physics and mathematics as compulsory subjects along with one of the Biology/Chemistry/Biotechnology/Technical Vocational subjects. Any candidate who passed 12th can give JEE main exam. Note: If any candidate appears in 12th class in 2019 are also eligible for JEE main 2019. Diploma holder also eligible JEE Main 2019 but its rank in JEE main not considered for admission in NITs & CFTIs. If any candidate wants to give paper-2 for admission in B.Arch must qualify 12th with subjects physics, chemistry and mathematics 50% marks. Nationality: The candidates should be of Indian nationality but Candidates belonging to NRIs, PIOs, OCIs & Foreign national candidates can also apply JEE Main 2019. Limit of Attempts: JEE Mains Exams Attempts of limit is 3. The online application applies date form 01/09/2018 to 30/09/2018 till. For more detail go to Official JEE Mains 2019 website https://jeemain.nic.in/. JEE Mains 2019 online apply registration process will be done through online mode. If any candidate fails to submit application form, they will not allowed to attempt the examination. We give the below full information how to fill or apply JEE mains 2019. Note: Before apply JEE Mains 2019 prepare the following documents to fill application form Aadhaar Card or any other government approved ID proof , X and XII Certificate, Valid Gmail Id, Valid Mobile Number, Scanned Photograph, Signature, Parent’s/Guardian Signature. · At the time of form filling, candidates also have to select exam city center as per the choices of papers. · While filling GATE 2019 application form candidates need to upload scanned photograph, signature. Candidates also have to upload their Father/Mother/Guardian signature. · If candidate fill multiple application form, candidate application from will rejected by board. · The payment has to be done through online mode i.e., net banking/debit card/credit card. The fees is not refundable. Correction of application form JEE Mains 2019 will 8th or 14th week October 2018. For fess detail for paper-1 and paper-2 see tables below. NTA (National Testing Agency) will be release the admit card for JEE Mains 2019 in 17 December 2018(for January session exam) and 18 march 2019 (for April session exam). To download admit card use your application number, date of birth and security code. The admit card important JEE Mains 2019 if you not bring the admit card to the centre, then he/she will not be allowed to attempt the exam, also carry valid id proof. All detail exams date 2019 exams centre and other information will be available in JEE Mains 2019 admit card. NTA (National Testing Agency) will release the JEE Mains 2019 official answer key will release in the month of January 2019. This answer key help you check your correct answer and will help you to calculate JEE Mains 2019 score. If you are not satisfied with your answer key you can fill application and have to pay 1000/- per question to challenge the answer key. NTA (National Testing Agency) will be announced JEE Mains 2019 result in 31 January 2019 for January session and 30th April 2019 for April session. You can check your result through online mode. After announcement JEE main exam result a rank will be prepared as per marks obtained in exam. The rank will be released separately for both paper-1 and paper-2. Admission will be given as per rank scored. After NTA (National Testing Agency) will be declared of result, board will announced the detailed schedule of JEE Mains 2019 counselling. Separate schedules will be announced for All India Rank and state level counselling. Counselling process for JEE Mains exam 2019 conducted through online mode. Counselling will be organized third week of June 2019. A centralized counselling will be organized by JoSAA and CSAB in different rounds. To appear in the counselling, candidates will have to register themselves. After that candidates have to fill their preferences of colleges and courses. On the basis of filled choices, rank, category and seats availability, a provisional seat allotment will be announced. After that, candidates will have to download their provisional seat allotment letter and pay the seat acceptance fee. After paying the fee, candidates have to report to the reporting centre to verify their documents. Once the seats get confirmed by the reporting centre, candidates have to appear at the allotted college for further admission process. Important Date of JEE mains date 2019. Here below tables provide you detail important date or JEE Mains 2019 (January and April) exams.